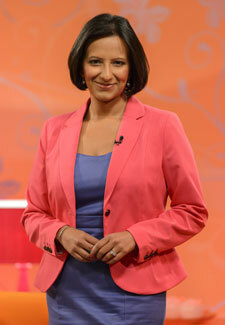 Earlier this year, TV presenter Ranvir Singh moved from North West Tonight to London’s Daybreak studios and now co-presents the 6 o’clock newshour with Matt Barbet. How are you coping with the early starts? I’m used to the odd hours because I’ve done a lot of early shows in the past. And I’ve got a small baby, so it all fits in beautifully. Well, I’ve been told you can put on an awful lot of weight doing a breakfast show because you’re tired, you’re vulnerable, the pastries are there and the temptation to reach for them is huge! You’re usually behind a desk on Daybreak – are you a flat shoe or heels person? [laughs] I wear beautiful shoes! I’ve got leopard print heels, some with metallic toe caps, but they only get seen for ten seconds at the start of the show at 6am. I want a ‘shoe cam’ on Daybreak – let’s start a campaign! I could be wearing hiking boots behind the desk and nobody would know. You became a mum during the summer, just as you got the job on Daybreak – you must have been busy. Yes, I also moved to London from the north. All it requires is an exceptional level of organisation. The house is a tip but it doesn’t matter. I make lists in my mind. Then my mind goes blank and I wish I’d written things down. How are you getting on with Aled? He’s lovely. The other day he told me, ‘I love your northern accent.’ I felt like Hilda Ogden! Maybe next time I should come on with rollers in my hair and a yard brush and sweep the studio. Is our Richard Arnold keeping you amused backstage? [laughs] He is so quick witted – his word play is amazing. And finally, what do you admire about Lorraine? Lorraine, the lady herself. The thing that impresses me most about her is that when she walks into the make-up room in the morning before going on air she is exactly the same as she is on screen. She’s very real, there’s no act. I’ve watched her on the TV as a fan and I never thought I‘d be working with her. She makes it look so easy. Daybreak is on ITV1 weekdays at 6am.